During the 17/18 ski season's dismal December, one of the worst snow years and ski season starts for Colorado in decades was pointing and laughing at our family’s annual ski trip. Yet here we were at Copper Mountain in early January, thinking about how great the snow on the sides of the runs was holding up considering (and compared to the other ski resort we’d just ice skated for only two of a planned four days to ring in 2018). But the laughs and woohooing coming from just below the canopy would tell a different story. A pristine glade stash? It was not. From the American Flyer lift, we watched person after delighted person speed and slither through the trees on Copper Mountain’s new Rocky Mountain Coaster, which opened December 2017. Alpine coaster riders descend about as fast as the average skier on a well-chosen, albeit predetermined line of adventure. But still, I had to wonder: were mountain coaster passengers having as much fun as the skiers on the mountain? One indicator may perhaps be the number of mountain coasters going up at ski resorts, especially trending in Colorado with new rides popping up at Copper, Steamboat, Snowmass and Purgatory. Likened to an alpine slide on rails, this type of attraction has become a popular destination diversifier as ski resorts in North America start to resemble those in Europe in the way they cater to non-skiing guests all year long. Mountain travelers who opt out of skiing for any number of reasons, it would appear, will no longer be relegated to the tubing hill, the shopping strip or all-day après (après snowshoe, that is). 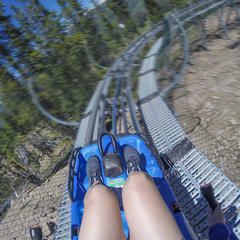 "While we did see a fair number of guests coming just for the coaster, in general, even skiers and riders are looking for more activities to do at ski resorts other than skiing and riding," Copper Mountain's Public Relations Manager, Taylor Prather says of the resort's first winter operating the Rocky Mountain Coaster. "There were plenty of Coaster riders going up and down in their ski boots, all hours of the day, so many are simply taking a break from the slopes for a little fun in between runs." For those destination/overnight visitors who don’t ski or don’t want to ski every day, Copper's coaster is a great activity to complement their vacations, Prather adds. Similarly, Steamboat is seeing "a combination of use," according to the mountain's Sr. Communications Manager, Loryn Kasten. "Many skiers and snowboarders ride the mountain coaster when they’re not sliding on the slopes (a day off, during the evening hours, etc). 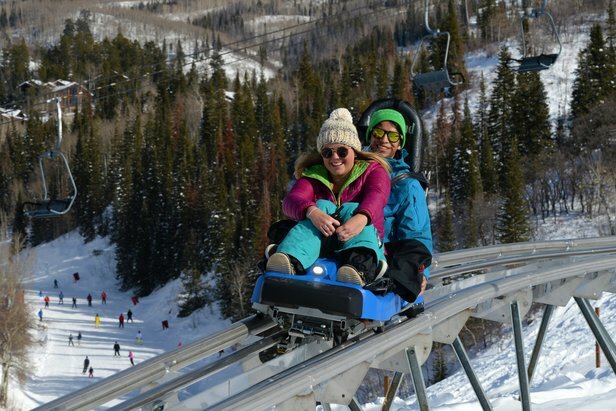 Steamboat guests who like the snow but don’t ski or snowboard love the mountain coaster because it allows them to be on the mountain in another way." Alpine coasters are as fun as they look. 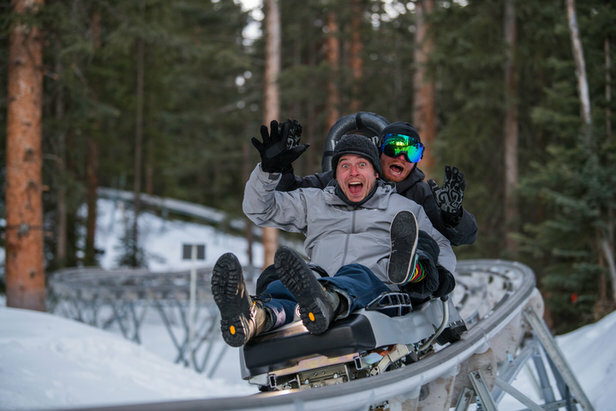 Snowmass' alpine coaster debuted in December of 2017 "as part of our Lost Forest project to provide multi-season, non-ski activities for guests," reports Public Relations Manager, Tucker Vest Burton, who mentions accessibility—for all ages, athletic abilities and families—as a key draw. 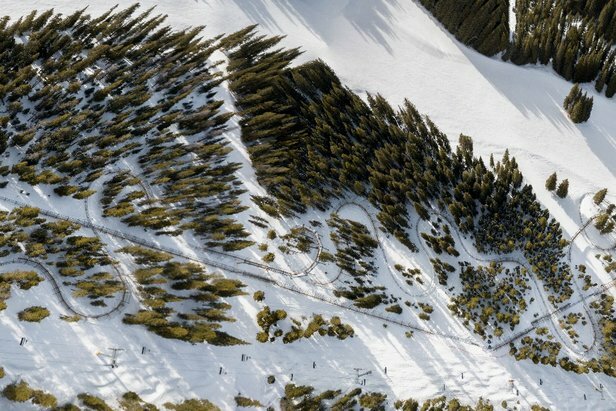 While similar in usage, speed and scenery, mountain coasters across different ski resorts appear to differ in their course elements and through one other fundamental feature: braking. "The Breathtaker Alpine Coaster is a user-operated ride," says Vest Burton. "Drivers are responsible for controlling their speed, maintaining a safe distance between sleds and stopping at the finish." At Copper, however, an automatic braking system manages the distance between coaster carts, but riders can also control speed with manual hand brakes. Steamboat emphasizes safety with a hands-on braking system: "Guests engage the sled by pushing the side levers down. When they want to brake, they raise the levers, allowing them to control their own speed. If a guest takes their hands off the levers, the sled stops," Kasten says. "Controlling one's speed during the ride is the key to a fun, safe ride." Looking to get your coast on? 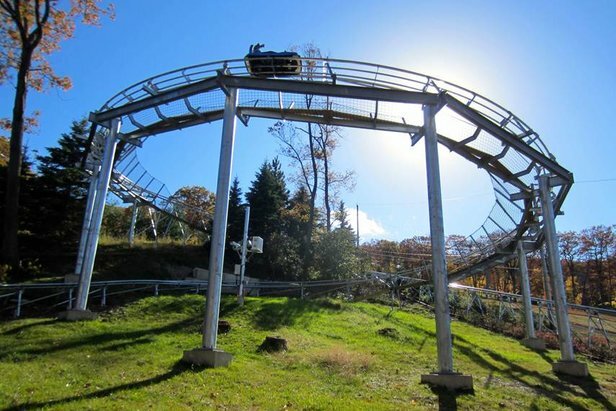 Check out this list of ski resort alpine coasters across North America organized by region and length, many of which are set up to thrill year-round, come snow or shine. 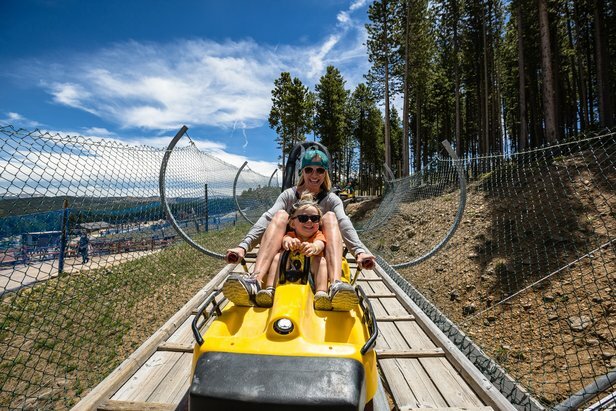 Don't see your favorite mountain coaster on our list? Contact Feedback_OTS@mountainnews.com and let us know what we're missing. Editors' Note: Operating hours and prices change throughout the year and may vary from what’s published here. Please click through to check with the resort directly. • Operating hours: 11 a.m.–5 p.m.
• Fun Facts: The longest coaster in North America, which takes about 10 minutes, The Outlaw Mountain Coaster rises up to 40 feet above the ground and cruises at speeds up to 27 mph. Many skiers and snowboarders ride the mountain coaster when they’re not sliding on the slopes. • Fun Facts: Average grade for the Rocky Mountain Coaster at Copper is 10.9 percent. The Snowmass Breathtaker Alpine Coaster. 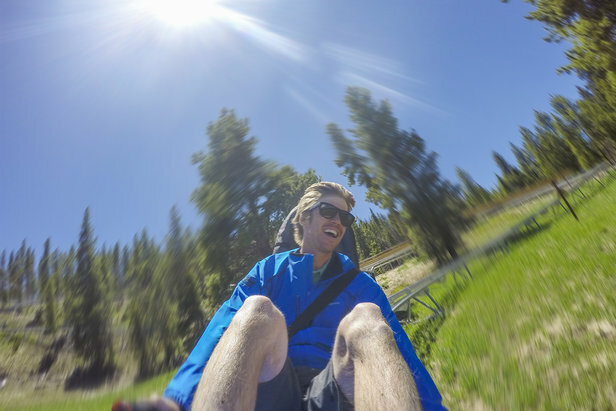 Bogus Basin's Glade Runner Mountain Coaster is one of a kind in Idaho. • Operating hours: Friday, May 25–Monday, September 3: 10 a.m.–8 p.m. Monday–Saturday, 10 a.m.–7 p.m. Sunday; Tuesday, September 4–Sunday, September 30: Thursday–Sunday: 11 a.m.–6 p.m.
• Operating Hours: Daily 10 a.m.–6 p.m.
• Fun Facts: The Forest Flyer Mountain Coaster follows the natural contours of the landscape as it winds down the mountain. The Forest Flyer coaster at Vail is part of its Epic Discovery. • Fun Facts: The track gets as high as 43 feet off the ground and features four circles and six bridges. 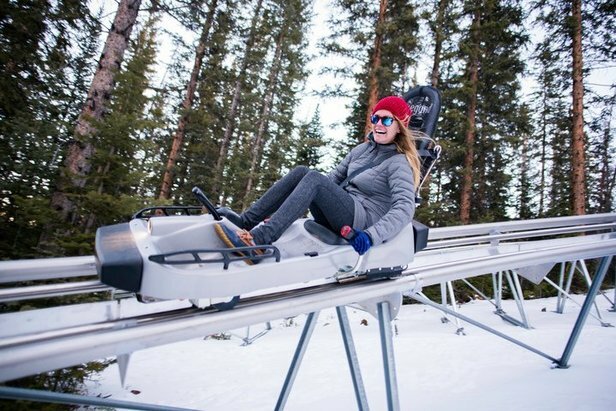 • Operating Hours: Daily 9:30 a.m.–5:30 p.m.
• Fun Facts: Breck was the first Colorado ski resort to build an alpine coaster (opened in the winter 2010/2011 season). 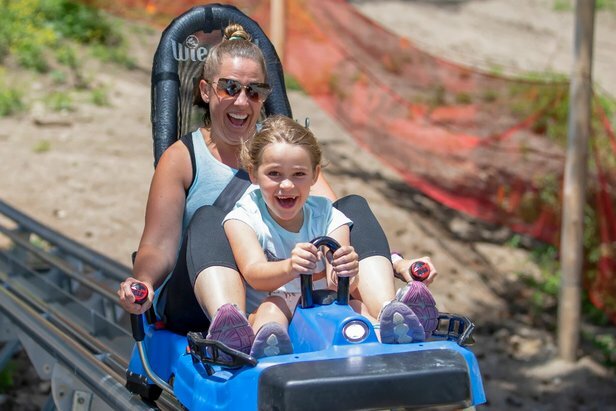 Start your ride at an elevation of 10,230 feet, before racing down the mountain, hitting speeds of up to 25mph on 2,500 feet of elevated roller coaster track as you enjoy a thrilling journey around and through the forest. 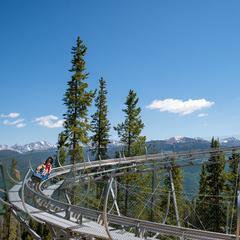 Breck was the first Colorado ski resort to build an alpine coaster (opened in the winter 2010/2011 season). • Cost: An Adventure Center Day Pass is $70 and includes the Beast Coaster, the new Woodward WreckTangle and more than 10 other attractions. • Operating hours: 10 a.m.–7 p.m.
• Fun Facts: Say cheese! An automatic Coaster Cam snaps your photo midway through the Appalachian Express adventure. • Operating hours: 10 a.m.–4 p.m. Sunday–Thursday; 10 a.m.–6 p.m. Friday & Saturday beginning June 23. • Fun Facts: The downhill track is designed with swooping turns, banked corners, rolling drops and 360° turns. 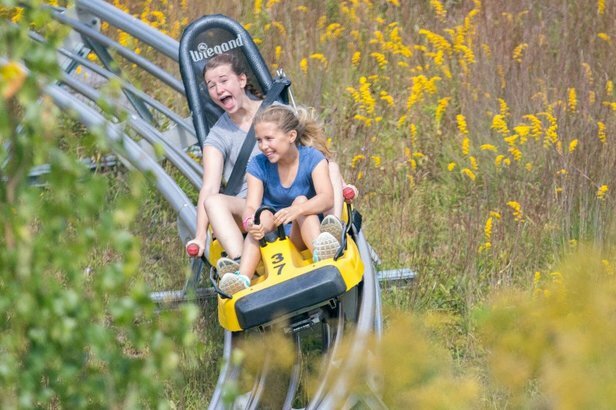 • Fun Facts: The Thundebolt Mountain Coaster is powered by wind turbines and an array of solar panels and features a computer-assisted safety system that stops the coaster if the seat belt is disengaged. 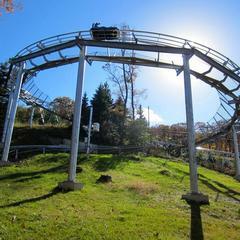 • Fun Facts: Jiminy’s Mountain Coaster was one of the first alpine coasters in the United States. • Operating hours: Friday–Sunday, 10 a.m.–6 p.m.
• Fun Facts: At the end of the Mountain Coaster ride, an automated camera captures the coaster experience. • Operating hours: 11 a.m.–6:00 p.m.
• Fun Facts: The ride features 15 curves of varying length, 12 waves, one jump, plus a huge circle/spiral, descending a max grade of 23.6 percent. • Operating Hours: Weekends Memorial Day–mid June 10 a.m.–5 p.m.; Daily Father’s Day weekend–Labor Day 10 a.m.–5 p.m.; weekends Labor Day–Columbus Day 10 a.m.–5 p.m. Winter hours: Friday, 4 p.m.–8 p.m., Saturdays and holiday/vacation periods, 10 a.m.–8 p.m., Sunday, 10 a.m.–4 p.m.
• Fun Facts: Thousands of feet of twisting, turning fun flying through the woods. You control the speed for a leisurely ride or a screaming fast run through to the end. 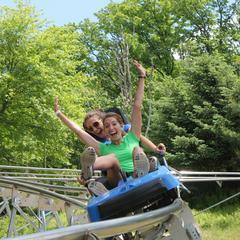 Cranmore Mountain Adventure Park mountain coaster. • Operating hours: 11 a.m.–9 p.m.
• Fun Facts: An investment of $ 2.5 million, Viking took its first voyage in 2009 and was designed by the German company Wiegand. • Fun Facts: Riders travel across ski runs, between glades and through a tunnel up to 42km/hour (26 mph). • Operating hours: 9:30 a.m.–4 p.m.
• Fun Facts: Coast through forest, natural rock formations and two lateral loops with panoramic views of Lake Tahoe. Have your own mountain coaster pics to share? Email them to feedback@skiinfo.com with the mountain, photo caption and credit, and we'll add them to our gallery. 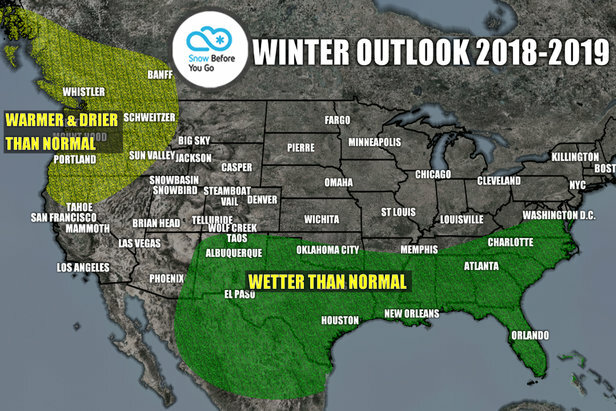 Meteorologist Chris Tomer's outlook for the 18/19 ski season predicts a pseudo El Niño. See what that means & where to ski.